Cory Monteith and his girlfriend Lea Michele were planning to move in together before his tragic death last weekend. 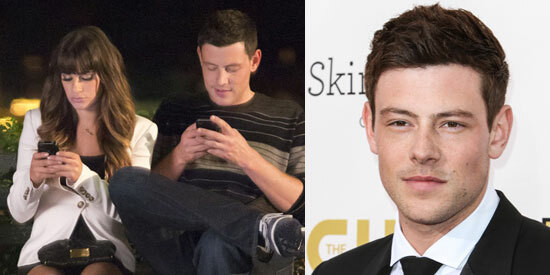 Cory Monteith enjoyed "a quiet night with a lot of laughing" two days before he passed away. The 31-year-old actor was found dead in his hotel room in Vancouver, Canada, on Saturday (July 13), but on the Thursday (July 11) he had dined with manager Elena Kirschner and acting mentor Maureen Webb at East of Main where the actor seemed happy. Maureen told PEOPLE magazine: "He looked so good, so healthy. I hadn’t seen him look that good in a long time. "We ate a lot of food. We drank the rhubarb lemonade." Cory had organized the dinner because he was planning on getting more involved with Project Limelight Society, a free theater program for kids who are driven to perform. Maureen, who is the co-founder of Project Limelight Society, added: "I told him, ’I remember everything we talked about when we first talked about this project. Now it’s happening.’ His face just lit up. He was in great spirits." Two days later the star—who played Finn Hudson in the musical drama Glee—was discovered dead by hotel staff after he failed to check out at the designated time. While there are no implications of foul play, the cause of death has been yet to be confirmed. MOVING IN. Cory was planning to move in with girlfriend Lea Michele before his death. Prior to his sudden passing, he was reportedly making arrangements to move in to his Glee co-star’s Los Angeles home, although the couple—who had been dating for more than a year—were not talking about marriage. An insider told Us Weekly: "Lea and Cory were planning on moving in together after he got back from Vancouver. "[Lea and Cory] weren’t talking engagement or marriage yet but it was heading that way. "The first step was Cory was going to move in [to Michele’s L.A. home] completely. He was already there all the time." Cory and Lea—who is "devastated beyond belief" about her boyfriend’s death—were said to be more in love than ever just before he died and planning a happy future together. The source added: "They were 100 percent happy and together and in love at the time of his death. AUTOPSY. Cory’s final cause of death might not be known for a couple of weeks. While his autopsy got underway earlier today (July 15, U.S. time), the British Columbia Coroner’s office says they will "definitely" not have the final toxicology results in by today. The office told Us Weekly: "We might well have an update tomorrow, but final cause of death might be several days or even a couple of weeks after that." Following the devastating news, the late actor’s fans have created a memorial for him outside the Fairmont Pacific Rim Hotel where he was discovered, placing notes and flowers in tribute. But it’s not just in the US and Canada where Cory’s death has been mourned as fans of Glee—who are known as Gleeks—paid tribute to the star at a Glee convention at the Thistle Hotel at London’s Heathrow over the weekend. Planned events including autograph sessions with cast members Curt Mega and Telly Leung—who play Nick and Wes in the musical drama series respectively—were ditched after the news of Cory’s death broke. Many of the supporters were chanting his name and singing a rendition of the Glee version of Journey’s "Don’t Stop Believin’".